Guatemala has “some of the lowest socioeconomic indicators in Latin America” according to USAID. An estimated 51% of the population live in poverty and 1 of every 2 children under the age of 5 are chronically malnourished. Organizations like GNE and Faith in Practice can make a difference. Faith in Practice (FiP) is a Texas-based NGO that sends medical mission teams to rural Guatemala and is the second largest provider of healthcare in the country. A team from Corvallis, Oregon, goes annually to perform surgical and medical care. Up to 500 people show up for these clinics daily. Faith in Practice also provides pre-natal supplements to all women of childbearing age. 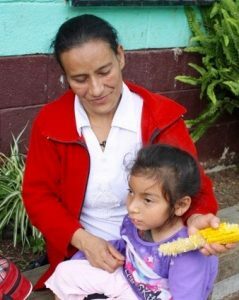 GNE’s nutrition education program, already trialed in Guatemala, is a perfect match. While women are waiting at the clinics to be seen by FiP, GNE will take diet histories and educate women about the importance of good nutrition. Programs addressing general nutrition, nutrition in diabetes and early childhood nutrition will be presented on electronic tablets. They are fun, interactive and designed especially for this audience. This is a good opportunity for GNE to focus on improving health through nutrition.